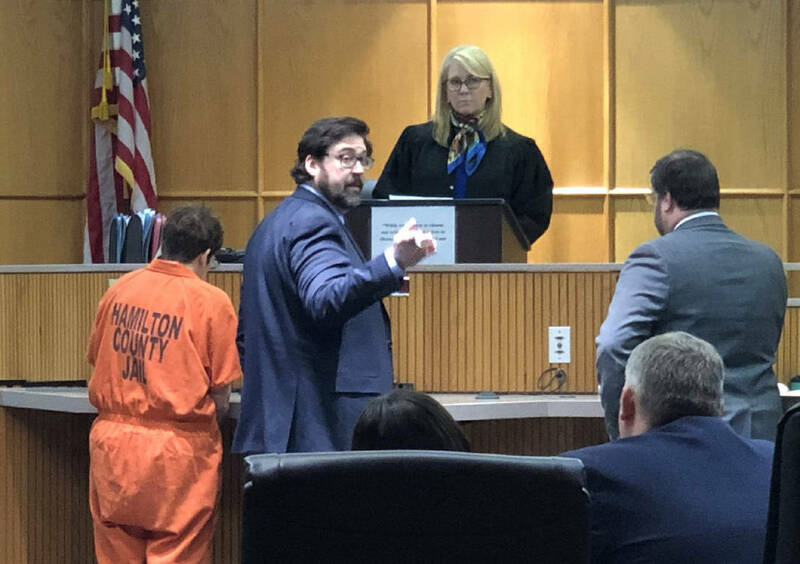 Janet Hinds appears before Judge Christie Sell in the Chattanooga-Hamilton County Courts Building on Monday, Feb. 25, 2019. Updated at 9:12 p.m. on Monday, Feb. 25, 2019, with information about the Friday funeral. The woman accused of killing a Chattanooga police officer over the weekend was behind bars Monday, facing nine charges related to the deadly hit-and-run. The arrest came two days after the incident on Hamill Road that killed 38-year-old Nicholas Galinger and triggered an extensive search by multiple law enforcement agencies and a Tennessee Bureau of Investigation alert. Janet Hinds, 54, of Hixson, surrendered to police Monday, had her blood drawn by authorities and received a $300,000 bond. She faces charges of vehicular homicide, reckless driving, leaving the scene, failure to report an accident, failure to render aid, violation of traffic control device, speeding, drivers to exercise due care and failure to maintain lane. Appearing in court Monday wearing an orange jail jumpsuit, Hinds stood quietly beside her defense attorney, Ben McGowan, who said the incident appeared to be an accident and pointed to recent heavy rains and fog as potential contributing factors. "Officer Galinger's tragic death is a terrible loss, which has brought great sadness to all involved," McGowan wrote in a statement after Monday's hearing. "As the case progresses, we believe it will be understood to have been an unavoidable accident. However, during this time our deepest condolences go out to this honorable officer's family, loved ones and fellow officers." In asking for a lower bond in court, McGowan said Hinds was born and raised in Hixson, has a house and family there, and has been gainfully employed for 33 years, now as postmaster in Soddy-Daisy. Aside from one guilty plea to speeding in 1998, court records show Hinds had no prior criminal history in Hamilton County. Executive Assistant District Attorney Cameron Williams asked the court for a high bond. He argued Hinds was a flight risk, noting that she left the scene and didn't turn herself in right away. And he said she deserved a significant bond because she killed a police officer. "In all likelihood the evidence will show" that she knew she hit something, Williams said. During Monday's hearing McGowan did not address Hinds leaving the scene, but he said she contacted his office Sunday. McGowan said he then reached out to the district attorney's office and that Hinds turned herself in once a warrant was issued for her arrest. Ultimately, Hamilton County General Sessions Court Judge Christie Sell sided with Williams, reasoning that Hinds might have known she hit something, whether or not she knew what it was. Sell set Hinds' bond at $300,000 with the stipulation that she be on house arrest and do no driving. Defendants must pay 10 percent of their bonds to be released, which in this case would be $30,000. They also can put up personal property as collateral with a court or bondsman. As of late Monday afternoon, Hinds remained in custody. Hinds is accused of speeding through the rain on Saturday, crossing the double center line and striking a warning sign placed in the center of Hamill Road. Authorities say Galinger was inspecting a manhole cover with water flowing from it on that road when he was struck. He was taken to a local hospital where he died. The driver fled the scene. Police issued an alert to the public to be on the lookout for a 2017-2018 Honda CR-V with front-end damage. On Sunday, law enforcement officials found a car matching that description at Hinds' address at 207 Port Drive in Hixson. It was about five miles from the scene where Galinger was killed. Hinds was not home at the time but officers secured warrants and seized the vehicle and other evidence from the home. Multiple law enforcement agencies joined in the search for Hinds. At one point, the Tennessee Bureau of Investigation added her to its Top 10 Most Wanted list and was offering a reward for information leading to her arrest. Then, nearly 48 hours after the crash, Hinds arrived at the police service center on Amnicola Highway to surrender. Once in custody, authorities sought a warrant for Hinds' blood and had it drawn, likely to test for drugs or alcohol. If testing reveals drugs or alcohol in her system, authorities could bring additional criminal charges against her. Hinds was scheduled to appear in court Tuesday, but that was to set bond. Since Sell did that Monday, that court date is cancelled and will be reset. News of Galinger's death continued to spread across the community here and among law enforcement agencies nationwide. By Monday, dozens of agencies had taken to social media to send prayers and offer support to his family. "Our hearts hurt today for Chattanooga Police & residents, and the family of Officer Nicholas Galinger who was killed by a hit & run driver," reads a tweet from the Franklin (Tennessee) Police Department. Local lawmakers and community leaders also expressed their sympathies. "This tragedy serves as a somber reminder of the immense sacrifice those who protect and serve our communities make daily," U.S. Rep. Chuck Fleischmann, R-Tenn., tweeted. Galinger, a relative newcomer to Chattanooga, had just graduated from the police academy in January. He will be buried Friday morning in his hometown of Cincinnati. Between 30-40 Chattanooga police officers will be traveling to Ohio for the service honoring their fallen colleague, a police spokeswoman said Monday night. The International Brotherhood of Police Officers Local 673 has started the "Ofc. Galinger Memorial Fund" on GoFundMe. The funds will be distributed to the family. As of Monday evening, the account had received nearly $3,000. Sunday's events were a surprise for many who lived in Hinds' neighborhood. Charles Moore, 87, lives on the block and came outside that afternoon to see police and other emergency responders filling the neighborhood. "I didn't know what the heck was going on," he said. "I was sitting outside; no one really said anything." He described the neighborhood as quiet and private. Across the street, Ken and Martha Shaffner were coming home from Nashville on Sunday night after picking up their grandson. "It was shocking," Martha Shaffner said of the scene. The couple knew Hinds in passing. Her son used to mow the Shaffners' yard when he was growing up. They would talk when the Shaffners went to drop off the money and got along well with the family, they said. "They've lived over there since [the son] was a kid," Ken Shaffner said. Chattanooga police are still trying to piece together what happened Saturday night. Mainly, investigators want to know what Hinds was doing in the hours leading up to the crash. "Anything that could explain Janet Hinds' whereabouts or behavior prior to the loss of Ofc. Galinger is needed for CPD's Traffic Unit to build the case for prosecution," CPD Traffic Investigator Joe Warren said in a statement. "Right now, we are early on in the investigation and even the smallest detail could be helpful." Anyone with information, photos, video, etc. is asked to call 423-698-2525, submit a tip in the Chattanooga PD mobile app, or contact Warren by email at jwarren@chattanooga.gov. The police department thanked all those who had reached out and the law enforcement agencies that have been aiding in the investigation. "The Chattanooga Police Department is grateful for the assistance we've received from our area law enforcement partners in the search for the suspect who killed Officer Nicholas Galinger," Chief David Roddy said in an emailed statement. "We also appreciate the outpouring of support we've received and continue to receive from members of our community." Staff writers Rosana Hughes, Mark Pace and Meg Scarbrough contributed to this story.